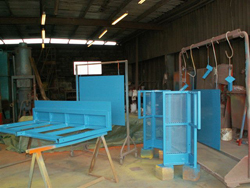 Industrial paint spraying includes air drying systems and stove enamelling for items up to almost any size. Specialist system are available such as high temperature and chemical resistant coatings. For general applications we offer an air dry single pack, Cromadex 222, a fast air drying Alkyd. Air dry single pack systems can be applied over bare metal or where required over a primer. An additional benefit of the air dry single pack system is that final touch ups can be made to the coating after instalation where onsite drilling or welding might be required. The Cromadex 222 product data sheet can be found here. We offer a standard general purpose temperature cured acrylic stoving finish in a full range of colours with or without primers through use of Cromadex 943. The Cromadex 943 product data sheet can be found here. For corrosion resistance we offer Interzinc 72, a zinc rich primer designed to maximise a coatings life expectancy. Some test results can be seen here.